Time approximate and subject to change. Two ways to view this Webcast are available. A $14.95 pay-per-view option will give you one-time access to watch all of the performing corps in Denver. 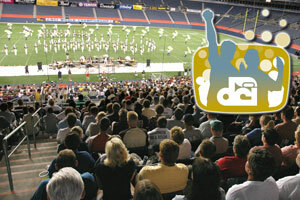 Choose the $59 Fan Network Plus subscription option to gain complete access to all 2009 Webcasts, on-demand replays of select DCI Tour events, discounts on downloadable media, and more! Visit TheFanNetwork.org to register for the Drums Along the Rockies Webcast.